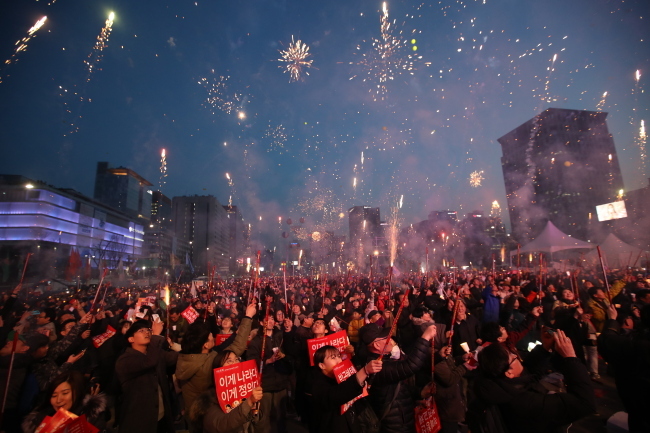 A day after the court ruled to remove President Park Geun-hye from office, hundreds of thousands of South Koreans gathered to celebrate the result in central Seoul on Saturday, while her supporters called for the impeachment to be invalidated. 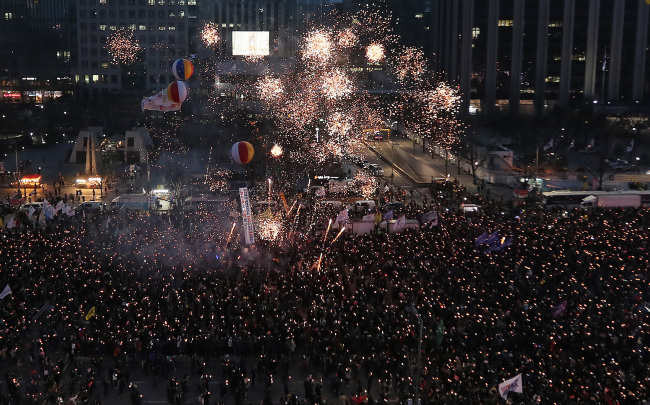 As of 7 p.m., an estimated 500,000 had turned up in Gwanghwamun Square, according to organizers. They set off fireworks and complete strangers in the crowd shook hands, exchanging gratitude and smiles and waving candles together. For them, Friday’s verdict was the fruit of their efforts to bring justice to a leader who has failed her own people for the interests of the rich and her inner circle. Since a sweeping corruption scandal broke out late October, a total of 16 million people have taken to the streets almost every Saturday evening demanding Park’s resignation, organizers say. “It is the victory we earned. The court confirmed that people are the owners of this country,” Jang Kyung-hee told The Korea Herald. The 21-year-old university student came from Busan with her friends to mark “the first, historic day” without Park in office. “Spring will finally come,” she said. The Constitutional Court on Friday ruled unanimously to unseat the disgraced leader, saying Park impaired the spirit of democracy and rule of law. The court acknowledged that she had abused her presidential power to help her longtime friend Choi Soon-sil derive personal benefits by letting her meddle in state affairs. The scandal and ensuing impeachment campaign also tore the nation in two. 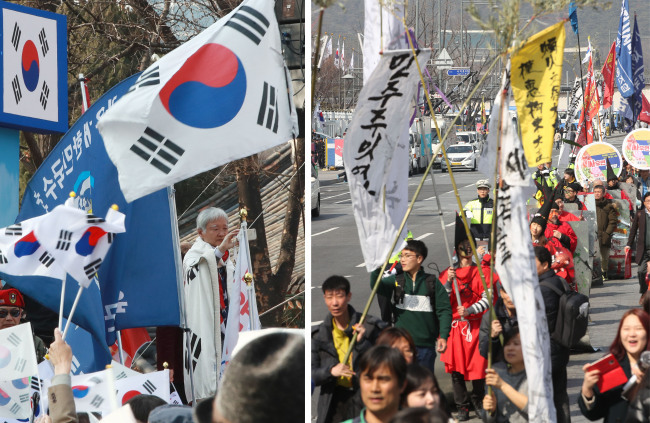 Just hundreds meters away, staunch Park supporters staged a protest in front of City Hall until the evening, denouncing the court as biased and vowing a nationwide movement to disobey the ruling, which cannot be legally challenged. “We cannot accept or yield to a ruling by the Constitutional Court. In the name of the people, we demand the dissolution of the court and a retrial by nine new justices,” Jeong Kwang-yong, head of an association of groups against Park’s impeachment. Despite fears of a possible eruption of violence, the rival rallies were peaceful, with no major reports of clashes or injuries. Shortly after the verdict, the pro-Park rally grew violent outside the courthouse, resulting in injuries and the deaths of three protesters. Police raised their alert to its second-highest level Saturday, dispatching some 16,000 officers in central Seoul. 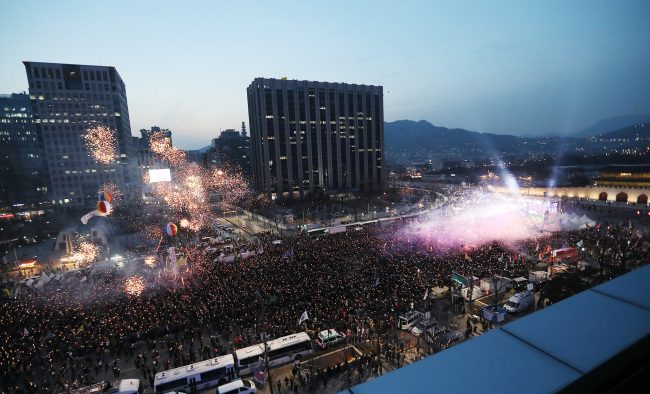 As dusk gathered, the boulevards surrounding Gwanghwamun Square turned into a festive outdoor concert venue, with singers performing and citizens taking the podium to make speeches. There were pancakes, rice cakes, cups of coffee and flower bouquets freely given out to the participants. The ruling stripped Park of the criminal immunity given to a sitting president, which would pave the way for prosecutors to launch a probe into her bribery, power abuse and other charges involving a face-to-face questioning and raid on Cheong Wa Dae. She is suspected to have helped extort 43 billion won ($37.6 million) disguised as charitable donations from the country’s top conglomerates, including Samsung Group, and giving favors in exchange. An independent counsel named Park as an accomplice to Choi as it recently wrapped up its 70-day probe into the scandal. “Park is such a shameless person. After being ousted for making the country like this with her corrupt activities, she did not even apologize, and stayed in the presidential office,” Lee Kyung-yeon, 22. Park has not made any statement on the verdict. She has stayed inside the presidential compound and is expected to move out in the coming days. Some expressed hope for a society that is more transparent and embraces differences.